A World Bank Report published in 1998 ranked New Zealand second in terms of ‘natural capital, behind Saudi Arabia.1 However, while we have a wealth of land, minerals, water, and good clean air, our bureaucratic planning and resource management laws have hindered New Zealand’s ability to use many of those resources effectively. The well-being of our communities has suffered as a result. The legislation that governs New Zealand’s crucial resource management activities is the 1991 Resource Management Act (RMA). Formulated by the 1987 Labour Government, it was passed into law by the 1990 National Government. The RMA was the brainchild of former Deputy Prime Minister and Minister for the Environment Geoffrey Palmer. He wanted to overhaul New Zealand’s environmental and planning laws in such a way that they also gave effect to the Treaty of Waitangi. The complex 314-page Resource Management Bill was eventually presented to Parliament but was unable to be pushed through before the 1990 General Election. However, thanks to the support of National’s new Minister for the Environment, Simon Upton, the bill became law in 1991. The RMA replaced more than 70 laws relating to planning, resources and the environment, including the Town and Country Planning Act. But while it was intended to create a more coordinated and comprehensive approach to resource management, the end result is an excessive focus on environmental protection, at a cost to New Zealand’s economic progress, jobs and growth. The problem is that the process behind these lofty intentions has been captured by an extremely well-funded environmental lobby. They have used the law to their own advantage in many parts of the country, overriding the needs of local communities and effectively shutting down progress. In effect, the RMA allows an open-ended loop for groups to keep appealing and re-appealing consents, with each new appeal starting from scratch instead of from the points of contention. This means that the litigants with the most stamina and the biggest cheque books are the ones that shape our planning laws, not local communities. Combine this with the limited focus of the Environment Court, which is not required to consider issues like jobs and housing needs that are fundamental to the social and economic wellbeing of a community, and the end result is a predominance of environmental issues at the expense of us all. A case in point relates to the coal mining company Bathurst Resources, which has spent $15 million dollars over a seven-year period trying to gain a resource consent for a new coalmine in a West Coast coal mining area that is crying out for new industry. The company wants to invest $250 million into the region and create 225 jobs. It hopes to export 1 million tons of coal a year from the enormous high quality reserves that can be found there, creating a multitude of downstream opportunities and overseas earnings. Bathurst’s proposal received approval from the Regional Council. However, objectors appealed to the Environment Court, saying the mine would seriously impact threatened species like snails and native vegetation, and exacerbate climate change. The Environment Court ruled that climate change objections were outside of its purview, so the objectors appealed the case to the High Court. The High Court ruled the same way, so the case has now been appealed to the Supreme Court. And so it goes on – up and down the country, projects which could provide jobs and a stronger economic base for New Zealand are stymied, with many entrepreneurs and investors simply walking away from projects that would create employment and wealth in provincial New Zealand. Ratepayers up and down the country also have huge concerns about the costs of the local authority RMA planning process. Collectively, New Zealand’s 78 local authorities have more than 170 resource management planning documents covering 2,272 different zones, management areas or policy overlays. The average cost to local authorities to produce their first RMA plans was $1.9 million per plan – $2.4 million in today’s dollars. In the case of the Queenstown Lakes District Plan, the total cost was more than $15 million. In addition, the average length of time taken by councils to finalise their district plans was 8.2 years, with many taking well over a decade. In other words, all ratepayers have been paying the huge cost of RMA inefficiency and bureaucracy. In comparison, Scotland, with 5.2 million people, has just 37 comparable planning documents. What’s worse, the bureaucratic nature of the planning process has made it extremely difficult for some councils to adequately respond to the needs of their communities. This is especially the case when it comes to housing. Projections show that 20,000 – 23,000 new housing units are required across the country per year over the next five years to keep pace with expected population and demographic changes. However, the average building consent volumes over the past three years show the current level of new housing construction is less than 15,000 units per year. The most acute problems are to be found in Auckland, which is expecting 75 per cent new growth over the next 30 years, and in Canterbury which lost over 16,000 houses as a result of the earthquakes. As a result of the RMA’s cost and complexity, many potential housing developments sit idle – the houses have not been built, the jobs have not been created, and the communities and schools have not been enriched by new families moving into their neighbourhoods. In addition, for nation-wide home builders, the process of navigating their way through the different district plans that even define such basics as ‘ground level’ differently is a nightmare that adds significant compliance costs to the price of each new home that is built. – Defining the types of development that should be processed without requiring notification. – A limit on affected party objections and tighter rules on appeals. – Limits on the conditions that may be placed on consents. – A 10-working-day time limit for councils to process non-notified consents. – A national template for planning rules, providing standard definitions and guidelines. – Integrating the various local council plans in a region into a single “unitary” plan. The reality is that the RMA has become the tool of choice for green-mailers and brown-mailers. It has also created a honey-pot for a new industry of planners and consultants. Unfortunately these rent seekers have harmed the communities they claim to protect. It will be those groups (and their political spokespeople) who will protest the loudest about the changes to the RMA that are being proposed – concerned that they will limit their ability to interfere with the private property rights of individual citizens, or limit their right to profit from the RMA process. Since their election in 2008, the National-led government has been up front about their desire to open up some of New Zealand’s enormous natural wealth to development to boost the economy and create much needed jobs. They want to see the benefits of stronger growth in better health and education and higher living standards. “The strongest economies of the high-income world – Norway, Canada, Australia, some Persian Gulf countries – produce oil and gas, coal, industrial minerals or food for the expanding global marketplace. The greatest success story, China, has based its rise largely on manufacturing. Brazil has been powered by a trifecta of higher energy production, a strong industrial sector and the highest volume of agricultural exports after the United States”. In looking at the US, he says, “Even more transformative has been the energy boom, largely sparked by new technologies such as fracking and deepwater drilling. This has transformed the Great Plains alone into the world’s 14th largest oil producer, roughly on a par with Nigeria and Norway. Unless stopped by regulatory constraints, this expansion may only be in its infancy”. The flow-on effect on the US manufacturing sector is profound: “Perhaps even more important, the expansion of the energy sector is galvanizing manufacturing, hitherto the weakest link in the material boy economy. The energy boom could create more than a million industrial jobs nationwide over the decade both to supply the industry and as a result of lower energy costs.” To read the full article, please click HERE. If you believe that New Zealand is being held back because our planning laws are biased against development and progress, you should consider putting in a submission on the RMA consultation paper, or attending one of the public meetings that have been scheduled around the country over the next two and a half weeks. These RMA meetings are being held in most centres in conjunction with consultation on the management of fresh water, another matter of crucial importance for all New Zealanders, which has no doubt been fast-tracked as a consequence of the Maori Council’s claim for the ownership of our fresh water supplies. 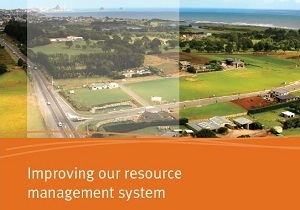 The full schedule of meetings and hui on RMA reform and freshwater management can be found HERE. Submissions on the Improving our Resource Management System discussion document close at 5pm on Tuesday April 2nd – see HERE. And submissions on the Freshwater reform 2013 and beyond discussion document close at 5pm on Monday 8th April – see HERE.